Koto-ku is home to a myriad of restaurants. From the historic to the hyper-modern, it seems like every country or region in the world is represented. 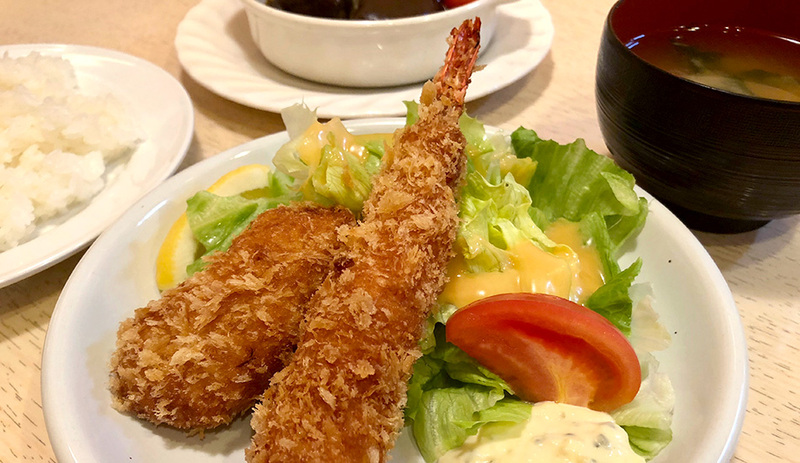 Relatively unsung in recent years, yet maintaining their popularity, are yoshoku restaurants that specialize in Japanese versions of Western or Western-inspired dishes. 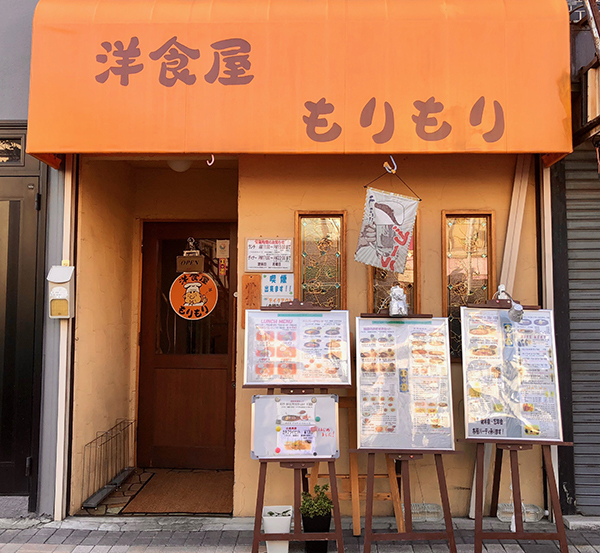 On a recent balmy autumn afternoon, I dropped into the Yoshokuya Morimori restaurant on Kiyosumi Street near Morishita Station. The unusual stained-glass windows diffuse the light and create a snug, inviting atmosphere. 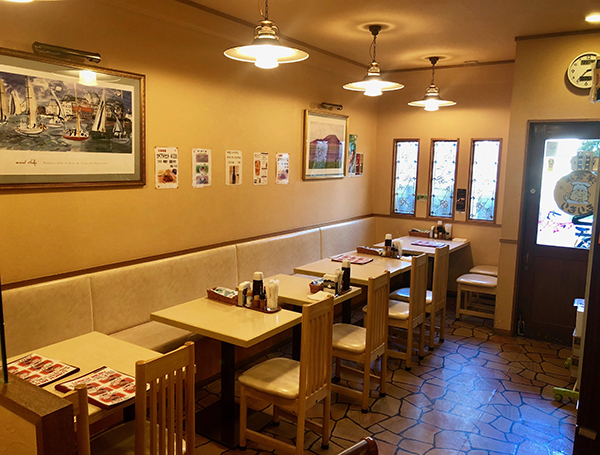 “We have two menus, one for lunch, and one for dinner,” says Mr. Mori. 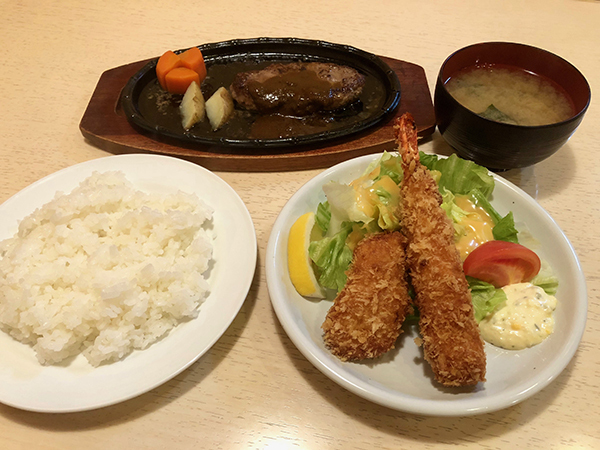 “The lunch menu features sets, with hamburg steaks, fried chicken and beef stew as the main .” Hamburg Set A is the most popular, pairing a 100% Japanese beef hamburg with a large deep-fried shrimp and a crab cream croquette. 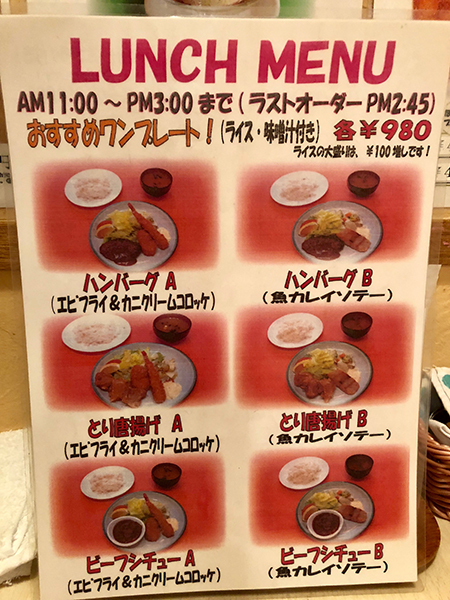 The other A sets feature fried chicken or beef stew instead of the hamburg, while the B sets includes fried Japanese flounder instead of the shrimp and croquette. 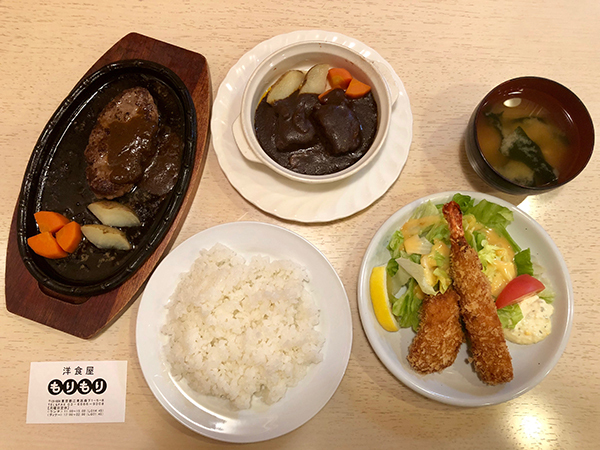 A great deal at 980 yen, this is the top-selling lunch set and comes with a hearty bowl of miso soup containing seaweed and tofu, as well as a serving of rice. Delicious! 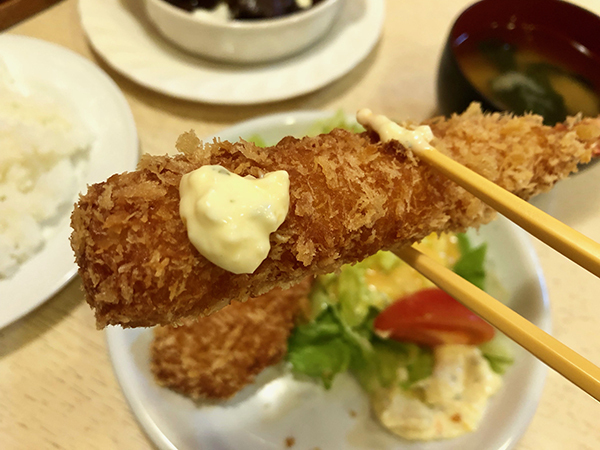 A juicy, plump shrimp deep-fried to perfection in crispy panko breadcrumbs and served with a wedge of lemon and tartare sauce. 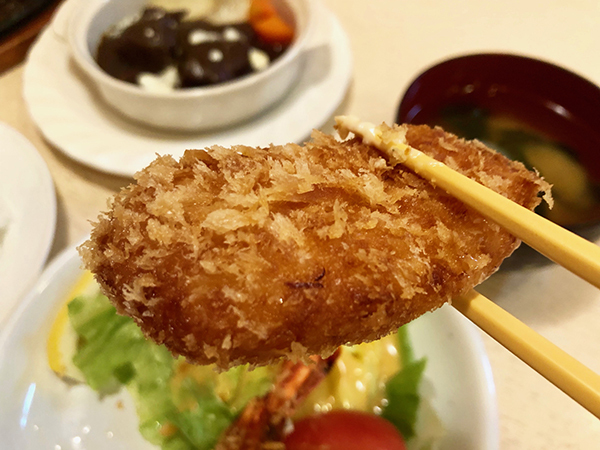 Crab cream croquettes are a popular item in yoshoku restaurants all across Japan. The outsides are crisp while the inside is a sublime creamy- crab flavoured delight. Kids of all ages love them! Be careful though as straight from the fryer they can be bursting with heat. It’s advisable to start with something else as you wait for them to cool down. Mr. Mori’s crab croquettes were perfect, crisp and firm, yet soft and creamy inside. There are over 50 dishes on the extensive menu at Morimori, all lovingly prepared by Mr. Mori alone. He starts his day around nine o’clock in the morning, receiving deliveries and cutting the meat, a skill he learned during his training. This hamburg was extremely tasty, meaty and well-flavoured yet not excessively greasy. The beef stew was something else. 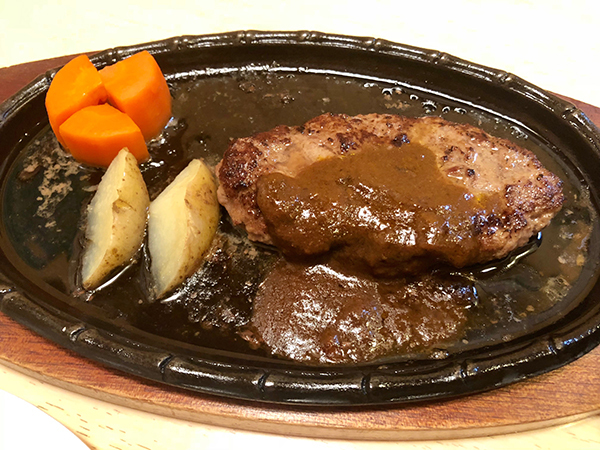 Mr. Mori makes the demi-glace sauce once a month, simmering the ingredients for around four days before freezing it. 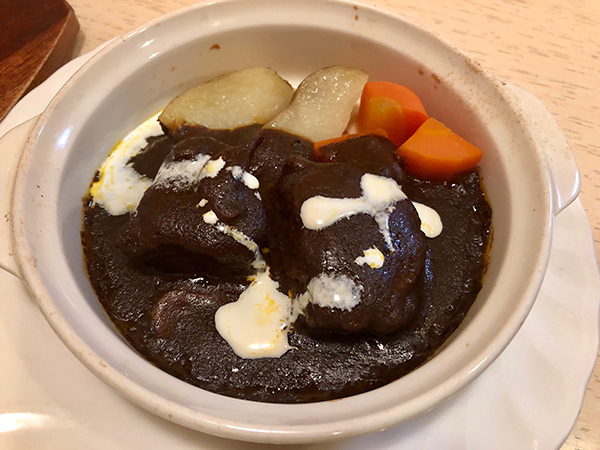 The beef shank is thickly cut and then simmered in the sauce for nine hours to create a melt-in-your-mouth softness that is truly wonderful. 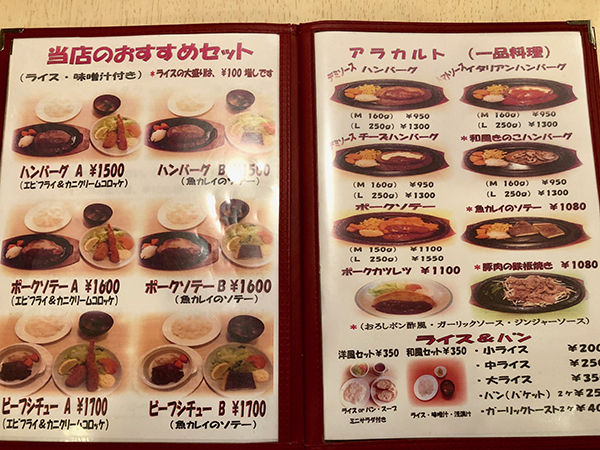 The dinner menu features a variety of sets such as the one detailed above, the Beef Stew A set which costs 1700 yen. The hamburg isn’t part of the set. Many favourites are featured, such as sautéed pork, pork cutlets, croquettes, salads, gratin and doria. Doria is a well-known Japanese Western-style dish, a kind of gratin made with rice and white sauce. There’s also an extensive drinks menu featuring a variety of beers, shochu, wine, and more. The restaurant is also open concept and has Wi-Fi. 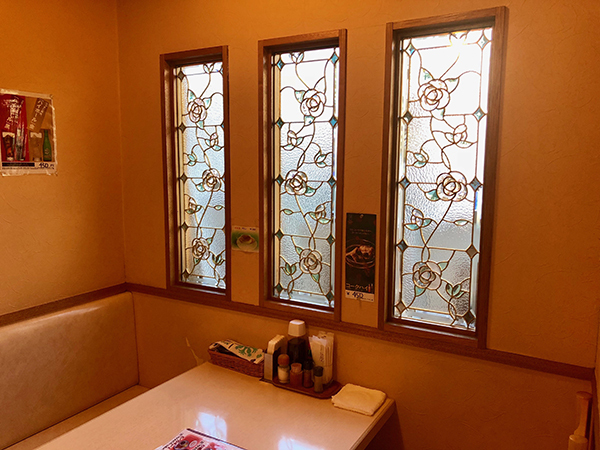 Ms. Mori has been studying English as the number of tourists staying in the convenient but reasonably priced Morishita area hotels has increased recently. 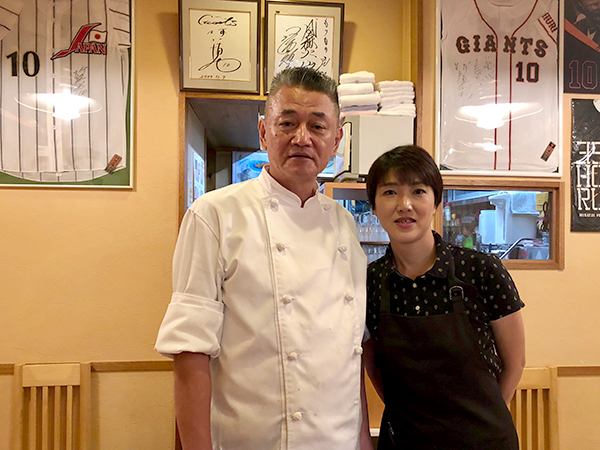 Wi-Fi, translation devices and global tourism may be contemporary developments, but the traditional yoshoku dishes served at Morimori are superb, refined through a lifetime of cooking by Mr. Mori. If you’re in the area and feeling peckish, then head to Morimori for some terrific Japanese-style Western food. Don’t just take my word for it though; there’s always a line of people waiting at lunchtime! As is usually the case, the locals know best.